Last year's blockbuster Interstellar performed quite well at the box office, taking in over $672 million worldwide. But the sprawling and ambitious sci-fi epic had many fans scratching their heads when it came to the ending, which was so complex we even broke it down at length back in November. Screenwriter Jonathan Nolan and producer/science adviser Kip Thorne attended a media event at Caltech's Jet Propulsion Lab to promote the release on Blu-ray and DVD, arriving from Paramount on March 31, where Jonathan Nolan revealed that the original ending was "much more straight-forward." If you haven't seen Interstellar yet, there will be SPOILERS below, so read on at your own risk. At the end of Interstellar, Matthew McConaughey's Cooper launches himself into the black hole known as Gargantua, in hopes of sending the data compiled on the signularity of gravity back to Earth. He ends up in "the 5th dimension," also known as the "tesseract," which he uses to essentially go back in time and contact his daughter when she is still a young girl. When asked about the original ending, Jonathan Nolan had this to say, revealing there was no "tesseract" involved at all. "(The original ending) had the Einstien-Rosen bridge [colloquially, a wormhole] collapse when Cooper tries to send the data back." The writer added that it was his brother Christopher Nolan's idea to add the tesseract, but Jonathan Nolan's original ending involved no time manipulation and no return home for Cooper. Jonathan Nolan wouldn't elaborate more on his ending, but it seems that it was much darker than how it played out in the movie. With the wormhole collapsing, there would be no way for Cooper to find Anne Hathaway's Amelia Brand, and Cooper wouldn't be able to reunite with his now-elderly daughter at the end. Other changes made from the original script were that the "gravitational anomalies" that Cooper and his daughter first noticed, which lead them to discovering the NASA facility, were supposed to be "gravity waves emanating from the destruction of a neutron star via black hole." Kip Thorne explained that since nothing in our universe is "catastrophic" enough to produce these gravity waves, the original idea was to have them emanating from a black hole close to our planet. Kip Thorne also said the waves were first supposed to be detected by the Laser Interferometer Gravity-Wave Observatory (LIGO), a real project that Kip Thorne is spearheading, but he explained that Christopher Nolan thought it was too scientific for the general public to comprehend. "That was very near and dear to me, but Chris thought it was too much science for the public to digest at once." In addition, we also have a new preview from the upcoming Blu-ray and DVD release, where stunt coordinator George Cottle breaks down the "waves" sequence, where the scientists land on a planet completely covered in water, as they try to find a safe place to land. The scene was shot in Iceland, where Doyle (Wes Bentley) tries to get back in the ship but is "ripped away from the back." We also hear from Wes Bentley himself and VFX Supervisor Paul Franklin about how this epic scene was brought to life, both on location and through visual effects. 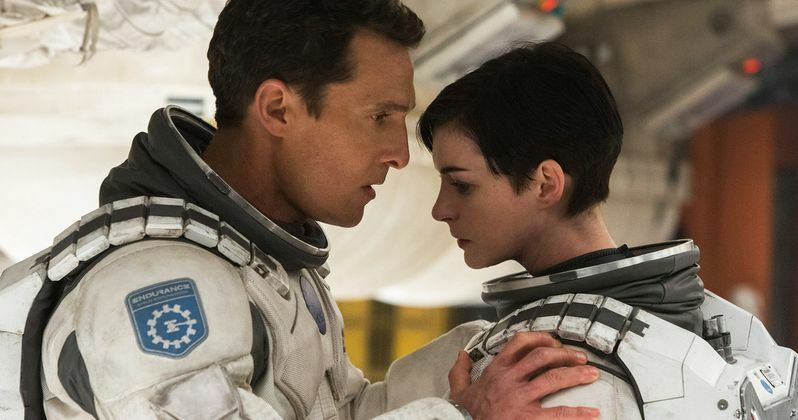 Take a look at this featurette below, and chime in with your thoughts about the Interstellar alternate ending.